I was enjoying an awesome sleep when Taryn awoke me this morning at 7am. We participated in a neighbourhood garage sale today, and it was time for me to set up shop. Taryn had a number of items set aside for the street sale, including boxes of books, a couple of mirrors, some baby stuff we don't need any more and some pictures that aren't currently hanging on our walls. 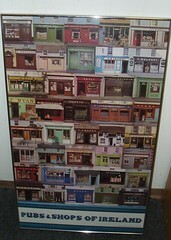 Two of those pictures were Doors of Dublin and Pubs & Shops of Ireland. My grandmother, turning 93 this year, was very proud of her Dublin heritage. Although she was born in Toronto, she often shared stories her father told her of Dublin and she loved items that reminded her of "home". When I was 11 or 12, I wanted to surprise my grandmother with a gift I knew would blow her away. 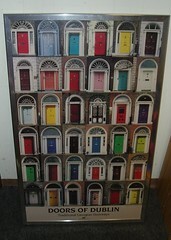 Joined by my brother Ryan, I visited The Irish Shop on Bloor Street and bought a poster called Doors of Dublin. We got it framed, and gave it to grandma for her birthday. She loved it, so a couple of years later we did the same thing with Pubs & Shops of Ireland. When my grandmother went into a long term care facility some years ago, I ended up with these pictures. They remind me so much of simpler times and brought so much joy to my grandmother, I couldn't let them go. This morning, as I carried everything from the basement to the driveway, I left these two pictures. I'm simply unable to part with them. We're in heavy duty simplification and minimization mode, but I'm keeping Doors of Dublin and Pubs & Shops of Ireland. They're not "stuff", they're drenched in unconditional love and they're not going anywhere. I am so proud of you for not selling those pictures that meant so much to grandma and showed me what amazing grandchildren you were to her. There are times when money just doesn't cut it and memories are so much more important. Thank you Michael for that. Im trying to find that poster for some relatives on the east coast and I'm wondering if there is any note of photographer or title?